Malt, rather than sugar, is what sweetens most food-service (i.e., restaurant/hotel) pancake mixes. For that typical "diner" taste, try malt in your pancakes instead of sugar. From amaranth to teff, ancient grains offer a world of baking possibilities. Find out how to make this recipe using ancient grains in our complete guide to baking with ancient grains. *Use 1 cup milk if you're baking under hot, humid conditions, or if you're going to let the batter rest longer than 15 minutes. Use up to 1 1/4 cups milk in cold, dry conditions. Gently and quickly mix into the egg and milk mixture. Let the batter rest for at least 15 minutes, while the griddle is heating; it"ll thicken slightly. 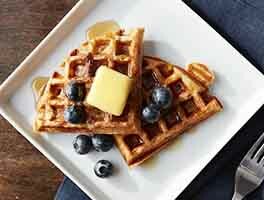 To make waffles, substitute 2 tablespoons melted butter or vegetable oil for 2 tablespoons of the milk. 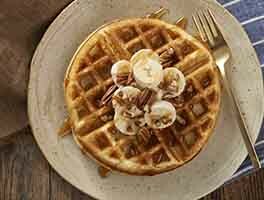 Cook waffles as directed with your waffle iron. Hint - if you try to open the iron and it doesn't open easily, the waffle isn't done yet. For a whole grain breakfast treat, replace 1/2 cup of the all-purpose flour with 1/2 cup of ground oats. For blueberry pancakes, sprinkle fresh or thawed frozen blueberries over the batter after you pour it on the griddle. Mixing frozen blueberries into the batter before scooping will turn it blue and streaky. Interested in learning more about ancient grains — and how to use them? See our complete guide to baking with ancient grains. 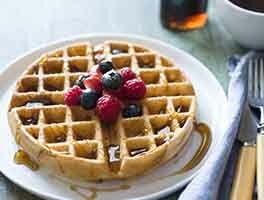 These are consistently one of my family's top-rated Saturday morning breakfasts! To send them over the top, I added some rehydrated dried huckleberries, which we picked a couple summers ago in the Blue Mountains of Oregon. The only thing that could possible make them taste better? Eating them in the very mountains where we picked the berries! Easy and delicious, however, barely enough to feed our small family of three...although possibly because my son ate 8.... :) Double the recipe if you have an athlete in the family! 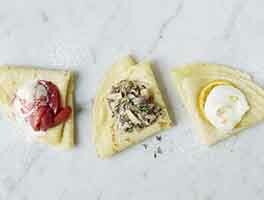 Easy, fast recipe that delivers wonderfully tender, moist pancakes. Delicious! Not my favorite. These were spongy and lacked flavor. 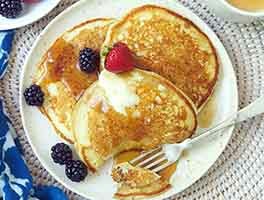 Will stick with my favorite which is the buttermilk pancake recipe. These were just OK. Didn't have a ton of flavor (I used malt powder) and they didn't brown like other recipes I've tried. The buttermilk pancake recipe on this site is my favorite but I didn't have any buttermilk on hand this time. Wonderful! I am embarking on a Beat the Winter Blues Pancake taste-off. This is #2. It is the winner so far! My King Arthur cookbook adds 2 t. vanilla to this recipe and I recommend it. These pancakes are the perfect combination of chewy and tender. Flavor is very good. Worth a repeat. This makes hearty and moist pancakes when mixed with whole wheat flour. I used cup white and whole wheat flour. Then I substituted 1/4 cup of yogurt for the same amount of milk. I also added the cup of grated apple and I used sunflower oil, so that I could let the pancakes cook on the cast iron griddle for awhile without burning. Everything else was the same. I hope they freeze well. It was enough for four or five people easily. Best pancake recipe I have ever used, best pancakes I have ever had. flavotful, moist light and airy and yet filling. I served with sliced apples that I cooked in butter, brown sugar, King Arthur Flour Vietnamese cinnamon and some bourbon. These pancakes hold their own against those flavors and textures for a wonderful bite! Wonderful! This is our household's favorite recipe for classic pancakes. We always include the malted milk powder and butter. They're an excellent foundation for maple syrup, salted butter, fruit, whipped cream, or any other topping that strikes your fancy. We've never had any trouble making them larger too, using a generous 1/3 cup of batter instead. They can be held in a 200F oven if you need some serving time wiggle room.